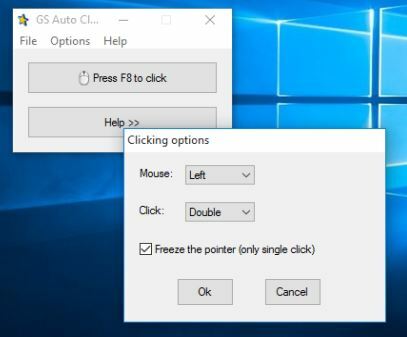 Here’s a list of 5 automatic mouse clicker software for Windows 10 which can be used to automatically perform mouse clicks on your Windows 10 powered desktops, laptops and tablets. Automatic mouse clicks can come in handy when you want to turn on the monitor at specific times (if it’s in sleep mode or screensaver is active) or if you need to click on a particular button within a program when you’re away from the keyboard. Let’s see how exactly it is that these applications work. 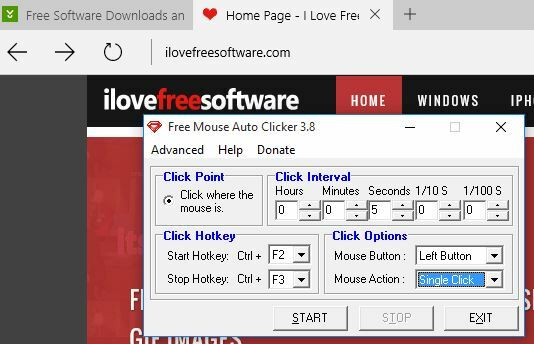 Free Mouse Auto Clicker is an automatic mouse clicker software that lets you setup automatic mouse clicks at a given interval, like 5 seconds, minutes, hours. It will click the mouse cursor wherever it is you leave it. Application can activate either left click or right click and it can also be a single click or a double click. I left the application to refresh a web page (left the mouse cursor over the refresh button of a web browser) and it worked. Just don’t forget to click on the “Start” button to activate the application. Get Free Mouse Auto Clicker. 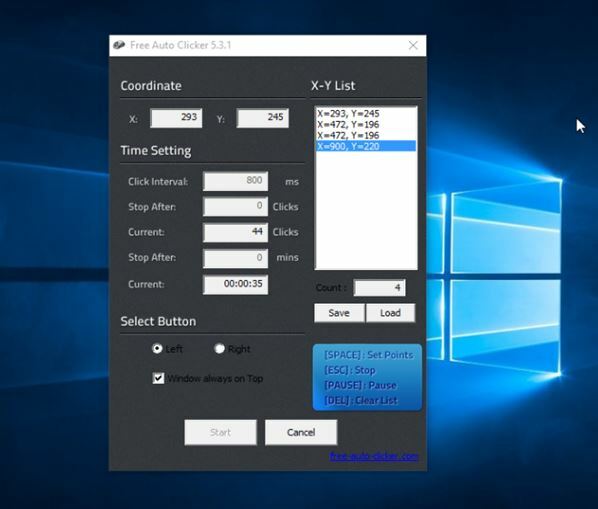 Clicker is a portable automatic mouse clicker software for Windows 10 which is highly configurable and it even lets you configure automated keyboard hotkey presses (like CTRL+C, CTRL+V, etc.). Interface for configuring automatic mouse clicks and keyboard presses has lots of options. Something that makes Clicker stand out a bit is support for setting up multiple mouse click locations. They can be recorded and added to a list, and all of them executed on a given schedule. Also, have a look at Free Auto Mouse Clicker Software For Windows: VMeisoft Auto Clicker. Free Auto Clicker is another automatic mouse clicker which supports multiple locations. It’s more simpler to use than Clicker, which is a plus in my book. Clicker has a lot of options and advanced features, whereas Free Auto Clicker only offers what you see on the image above. Click locations are set by pressing down “Space” and clicking on the screen. Alternatively the can be manually typed into using X and Y coordinates (in pixels). Other important settings include adjustable click interval, click limiter (stop after X clicks/minutes) and the ability to switch between left and right click. GS Auto Clicker is even more simpler than Free Auto Clicker, but still offers a lot of features. Once you run the application, you just need to press F8 in order to automatically start clicking on wherever the mouse cursor is located. Default click repeat time is 100 milliseconds, but this can be changed to up to hours. Limiter is included (stop after X clicks). Multiple location mouse clicks can be configured by opening up Recording >> Multiple clicks. Also, have a look at Free Software to Automate Keyboard and Mouse Clicks: TyperTask. 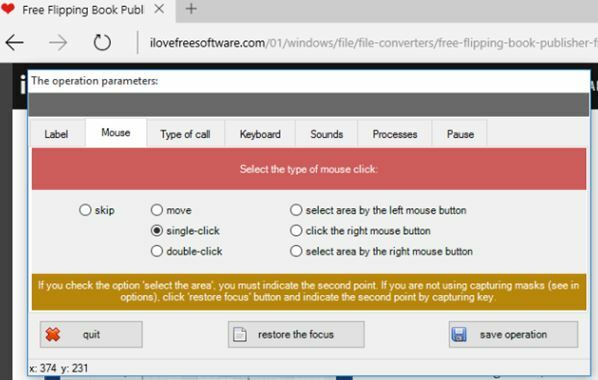 Auto Clicker Typer lets you record multiple mouse click locations, and after that they can be replayed on a loop. Start recording by clicking on the top left corner “Record” button. Perform the mouse clicks that you need to automate. They’re going to be added to the list. Once you’re done, tweak the delay in between clicks and the number of time you want the clicks to be performed. Click on the “Play” button starts the automatic clicker. Recorded mouse locations can be saved and then loaded up later on. Last two automatic mouse clicker software from the list above, GS Auto Clicker and Auto Clicker Typer impressed me the most. GS Auto Clicker can be simple if you need simplistic features and also advanced if you need advanced features. Auto Clicker Typer is slightly more advanced but still very easy to use. Let me know what you think by leaving a comment down below.